Why do we love to hate Umar Akmal? Wasim Akram, Javed Mianded, Misbah Ul Haq, and numerous other critics of Pakistan cricket have lambasted Umar Akmal for the way he lost his wicket against India in the 3rd ODI of the recently concluded series. Pakistan required only 43 runs in over 10 overs when Umar Akmal charged down the pitch and got stumped by Dhoni. Irresponsible? Surely. Rash? Ofcourse. But was he solely responsible for Pakistan's inability to chase 167? Was Umar Akmal the only culprit in that failed chase? Definitely not. And yet here he is, and here we are, complaining about Umar Akmal and how he fails to finish games for Pakistan. "When will he learn? ", "When will he grow up? ", "When will he become more responsible? ", "When will he start valuing his wicket? ", "When will he learn how to build an innings? ", "When will he stop throwing away his wicket?" These are the typical questions that everyone asks about Umar Akmal. I wonder if everyone realizes that the boy is only 22 years old. Twenty Two! Do you remember what you were like when you were 22? You really cannot expect him to be the guiding force of the Pakistan team. He is the one who needs to be guided continuously and taught the art of building innings, chasing totals, and setting totals from the likes of Younis, Misbah, and Hafeez. Umar Akmal should only be a supporting act in a team that has a lot more experienced batsmen in the line up. He should not be the one who takes on the responsibility that the senior batsmen shy away from. I really wonder why our fans have these unrealistic expectations of Umar Akmal. I also wonder if it is just because across the border there is one Virat Kohli, who has amassed a massive amount of ODI runs over the past two years. Kohli is an exceptional batsman; the last time such a great batsman arrived in international cricket was probably two decades ago. To compare Umar Akmal to him is very unfair. Also lets not forget that Kohli bats at number 3 for India, while Umar Akmal usually bats at 6 and occasionally at 5 for Pakistan. There is a huge difference between the roles of batsmen at 3 and batsmen at 5 or 6 in ODIs. Don't you ever wonder what it would be like to have Umar Akmal walk out to bat at number 3 in ODIs? He has done it for Pakistan U19, he has done it for Pakistan A, then why not for Pakistan? Why keep sending him lower down the order where he is either required to save the team from a collapse or press for quick runs in the closing overs of an innings? Why not give him the confidence and the freedom to bat at number 3 and bat for as long as he wants in the manner that he wants? Why not give him some more responsibility? Why not put more faith in him? It only makes sense to do this considering that everyone and their mother complains about Umar Akmal not being responsible enough. Give him the responsibility and then expect it. Don't expect it from him in near impossible situations. Enough of all this qualitative support behind Umar Akmal. Lets put some numbers out there and then see whether he really deserves all the flak that he has been getting or not. 71 ODIs. 2,001 runs at an average of 37.75. That is not a bad record by any standards. In fact, it is an extremely good record. How many Pakistani batsmen have you seen average in the high 30s in ODIs? I can count them on one hand. 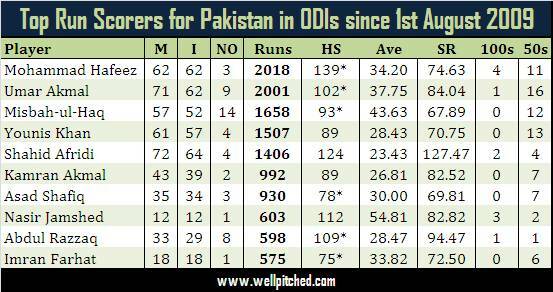 Lets compare this to other Pakistan batsmen in ODIs since Umar Akmal's debut, i.e. 1st August 2009. Now you didn't expect to see this, did you? Over the past 3.5 years since making his ODI debut, Umar Akmal is the second highest run scorer for Pakistan, has the 3rd highest average for Pakistan, has the 3rd best strike rate for Pakistan, and has the highest number of 50+ scores for Pakistan. Despite all this, he is Pakistan's most irresponsible batsman, hasn't learnt, and is not fulfilling his potential. Really!? Do Pakistan fans and "cricket experts" have even an iota of rational thought behind their criticism? Besides Mohammad Hafeez, and more recently Nasir Jamshed, no one in the Pakistan line up comes even close to the sort of performance that Umar Akmal has given for the team. Yet people want him out. Did anyone wonder why Umar Akmal was not in the team for the first two ODIs of the series against India? I mean you should have considering that his 10 ODI innings prior to the 1st ODI against India yielded scores of 21, 77, 28, 39, 36*, 3, 0, 55*, 52, 0. I really do not think that those scores warranted a sacking. So why really do our fans love to hate Umar Akmal? Maybe its the unanimous hate for that surname. Indiscipline has often been used as an excuse by the team management, but which Pakistan star in the past has not been indisciplined? Wasim Akram, Waqar Younis, Aamer Sohail, Shoaib Akhtar, Shahdi Afridi - they all have a history of indiscipline. Not that this gives Umar Akmal a license to be, but he is only 22 for God's sake. He needs proper guidance. He needs to be given confidence. He needs to be given a permanent position at a certain position in the batting line up. He needs to be given a role and than he needs to be taught how to fulfill that role. That is how you nurture a talent and make him achieve his potential. Enough of all this criticism. High time that someone started managing Pakistani talent properly! Great article! agree with it completely! Misbah is the one to blame for the loss in the last ODI. With reference to Umar Akmal, we expect to much because he has the talent. But, we need to give him time and he needs a guiding light i.e., Younis Khan. On a side note, YK for captain!! Nice and balanced analysis. His surname is definitely one of the reasons for the criticism. Our team cannot afford to have two Akmals in the side (definitely the bigger Akmal needs to go). Atique is right to point out that we expect a lot from Umar because everyone knows he has immense talent. I used to consider him the most talented batsman we produced since Yousaf (only Inzi and Yusaf in the last two decades). I think Jamshed has eclipsed Umar now and will continue to do so if Umar keeps on playing irresponsibly, remember Jamshed is also only 23. In any case this performance of Umar does not deserve a sacking from the team, definitely not when the replacement is Azhar Ali.